Everything at the Super Bowl halftime show was covered in rainbows, from Coldplay singer Chris Martin's shirt to the stage he was dancing on. At first, it seemed like an arbitrary artistic decision, but the intent became clear at the end. After the performances were over, the audience flipped over rainbow-colored placards that read "Believe In Love," a tacit endorsement of marriage equality. The Super Bowl's pro-gay marriage moment was refreshing and unexpected, and illustrated just how much public sentiment on the issue has changed over the last several years. In a sense, it wasn't too surprising. Super Bowl 50 was hosted in San Francisco — though the actual game took place in nearby Santa Clara — and San Francisco has long been a both an epicenter for gay rights and a very LGBTQ-friendly city in general. Harvey Milk's 1977 election to the San Francisco Board of Supervisors was a watershed event in gay history, and in 2003, then-mayor Gavin Newsom unilaterally ordered gay marriages to be performed in the city over a decade before the Supreme Court legalized marriage equality worldwide. I'll admit, I felt a chill down my spine (the good kind) when I saw "Believe In Love" displayed so prominently at one of the most popular sports events in America. This was a combination of local pride — I was born and used to live in San Francisco — and the simple reminder of the country's progress on LGBTQ acceptance. 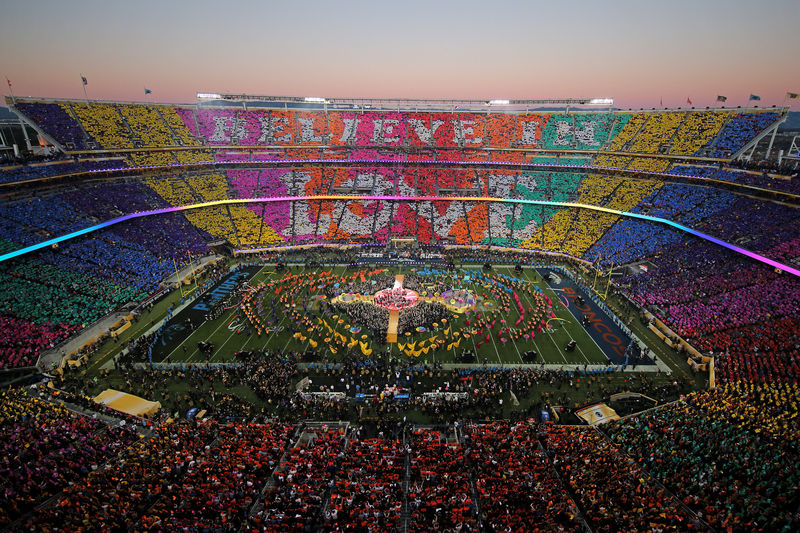 Even five years ago, it wouldn't have been conceivably for the Super Bowl to express an unabashedly pro-gay message during the halftime show. It was an important symbolic moment, and given the NFL's reputation for rampant homophobia, a very welcome one.